Adidas, Puma, Nike, and Lululemon are all ripping UA to shreds. I've recently discussed Under Armour's (NYSE:UAA) (NYSE:UA) poor management decisions and upcoming challenges. I've been bearish on this stock since last September, when it still traded in the high $30s, and I believe it still has room to fall. A key problem for Under Armour is that the competition is simply too intense. Let's take a closer look at four companies that could eat Under Armour's lunch in the near future. Adidas' (NASDAQOTH:ADDYY) growth stagnated for years before it initiated an aggressive five-year turnaround plan in 2015. That plan called for a faster rotation of its products, expansions into more urban markets, bigger e-commerce investments, and improved engagement campaigns with customers, retailers, and partners. That strategy has been paying off. Adidas' revenue rose 18% on a constant currency basis last year, while its net income surged 41%. That growth can be attributed to the popularity of "retro chic" products like its Stan Smith and Superstar lifestyle shoes, Kanye West's Yeezy shoes, and James Harden's basketball shoes. Last quarter, those products helped Adidas posted 31% year-over-year constant currency sales growth in North America -- which is notably UA's worst-performing market. Adidas' German rival Puma (NASDAQOTH:PMMAF) also posted a roaring comeback over the past few years. That comeback was fueled by its decision to hire celebrities as creative directors and brand ambassadors -- which meant they weren't simply the face of the brand, they actively designed the shoes and arranged promotional events. Puma's top spokesperson, Rihanna, for example, designed the company's hit Fenty brand, promoted the products to her social media followers, and arranged fashion shows. The Weeknd and Big Sean also designed their own shoes and arranged promotional photoshoots. These efforts boosted Puma's sales by 10% on a constant currency basis in 2016, with its total Americas revenue rising 8% -- likely at the expense of Under Armour. Nike (NYSE:NKE) remains the 800-pound gorilla of the footwear and athletic apparel market, but it's also been struggling to counter resurgent challengers like Adidas and Puma. Yet that doesn't make it any less of a threat to Under Armour. Nike's brand power, operating scale, deep pockets, and long list of endorsees -- including Michael Jordan, Kobe Bryant, Kevin Durant, LeBron James, and Derek Jeter -- forces Under Armour to spend heavily to remain competitive. 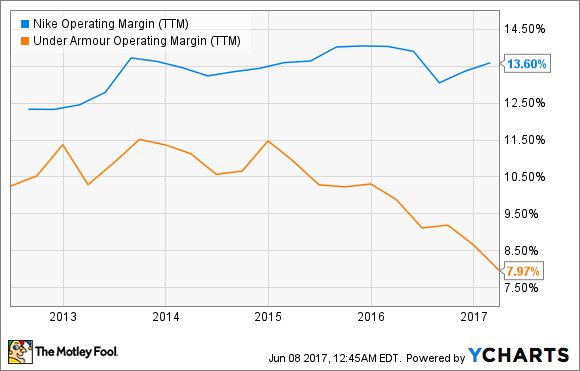 A comparison of these two companies' operating margins reveals that UA is clearly losing that battle. During last quarter's conference call, Under Armour CEO Kevin Plank stated that he was "incredibly bullish" on women's apparel and footwear. Back in January, Plank also highlighted women's apparel in the Arris Project, its first line of American-made leggings and sports bras, at its UA Lighthouse plant in Baltimore. Expanding into the women's athletic apparel and footwear market makes sense, but it's a highly saturated market. lululemon athletica (NASDAQ:LULU), which arguably started the entire athleisure trend among young women, already struggled last quarter with an earnings miss and sour guidance. If Lululemon keeps losing shoppers, it could resort to aggressive discounts, which would flatten price expectations and hurt rivals like Under Armour and Nike. Meanwhile, if Lululemon's plans to add new colors and upgrade its digital channels win back shoppers, it could pull back female shoppers from UA and Nike. Under Armour lacks the "retro chic" and celebrity appeal that help Adidas and Puma stand out in a crowded market. Instead, Under Armour's shoes are often mocked as "nurse" or "dad" shoes, and its CEO alienated its own celebrity endorsees -- including The Rock and Steph Curry -- with his glowing praise of President Trump. Under Armour also lacks the scale and marketing muscle to go toe to toe against Nike, especially in the lower-margin footwear market. It also lacks the brand reputation that Lululemon cultivated among female shoppers over the years -- which throttles its ability to turn its women's business into a sustainable pillar of growth. Unless UA can counter these rivals with new strategies, I doubt the stock will rebound anytime soon.